I’ve been working on creating a foldable tortilla recipe and, so far, not so good. 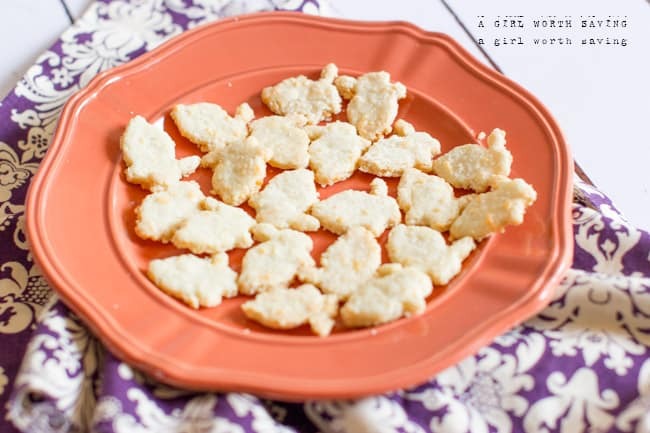 However, these recipe failures have lead to really awesome new recipe discoveries and this gluten-free White Cheese Crackers recipe is one of them. Seriously, when I pulled the dough out of the oven and took my first bite, I thought Holy Mackerel this tastes like Goldfish! In this recipe, I used sesame seed flour and expect to see it again in some of my upcoming creations. I love the almost sweet bitter taste that it gives to a recipe. 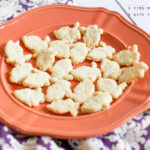 Ok, you don’t have to cut these into fun mini bunny shapes but, come on it, it’s pretty dang cute. If you don’t want to take the time to do this, just roll out the dough and cut it into squares. In a pan, combine the water, coconut oil, sea salt, garlic powder and onion powder and bring to a boil. Add in the tapioca flour and mix. Next, grind the sesame seeds into a flour. I used a coffee grinder to do this. Add the ground sesame seeds, egg and Parmesan cheese to the tapioca blend. Roll the dough out between two sheets of parchment paper so that it's 1/4" thick. 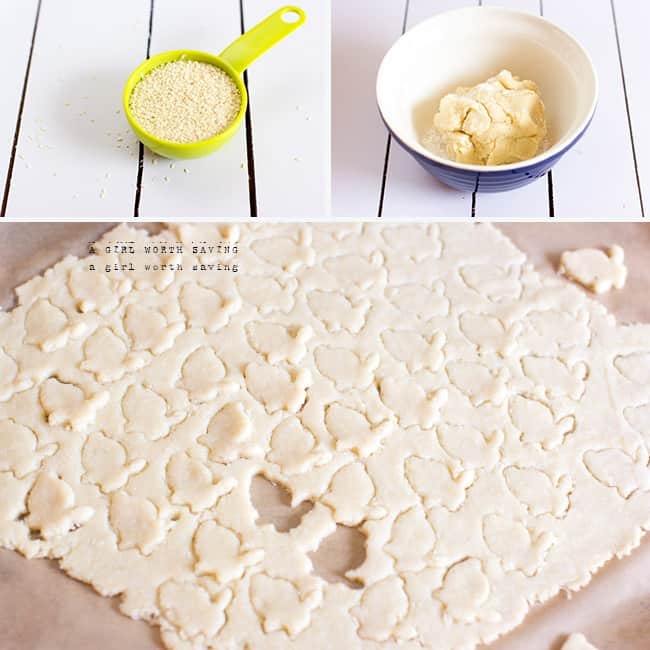 Now you can either just cut them into squares or use the bunny cookie cutter to create the shapes. 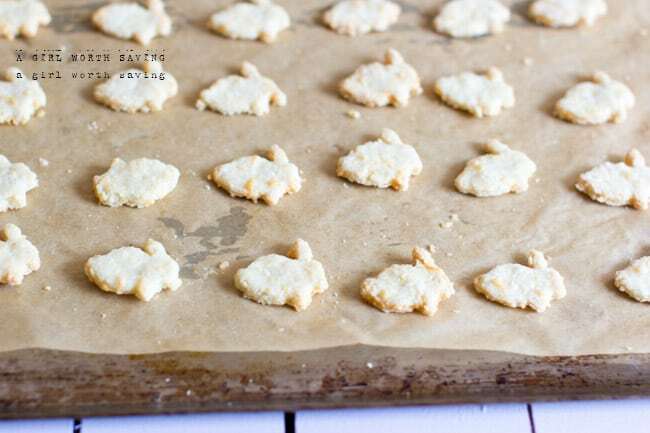 Lift each shape with a knife and place on a baking pan lined with parchment paper. Repeat until the dough is gone. Bake in the oven at 350 degrees for 20 minutes. So cute…and I like that you used your tortilla “mishap” to create something else. For foldable/rollable tortillas I use crepes (made with coconut flour) or thin omlettes a lot of the time. They are not quite a tortilla and they are a bit more delicate but they get the job done. ohhh cookies with coconut oil? so interesting. Any idea what I could use to replace the sesame seed flour? Honestly, I’ve never made this without the sesame seeds and I’m sure the flavor of the sesame is what makes it taste like a Goldfish cracker. You could try pumpkin seeds but, again, I’m not sure how that would work out. Those are so cute! I remember an art teacher telling us that we shouldn’t get upset about a mistake because it could become an amazing part of our art work. I suppose making your own recipes are the same way. It may not work the way you had hopped, but you could end up with something equally as good in the end. This recipe is amazing and gosh aren’t they cute! Those ARE cute! My boys would love them. this is something that would be perfect for school lunches! I’m going to have to give these a try, my kids love the organic crackers but I wanted to find a grain-free recipe! I hope you like them Kim! Got to love the happy accidents. And this looks so good! THese look great! my son would love them! This looks like such a healthier version of the golden snack my daughters crave but which I abhor because of all the ingredients. These look so fun! I bet my kids would love these! Those look delicious, not to mention being adorable! Those are SO cute, and my son and I would both love them! I’m going to have to try these out this weekend. My little one loves goldfish but I don’t like to give them to him often because of the ingredients. And my GF sister could eat these, too! Just made my first batch!!!! The Husband and I LOVE them … can’t wait for the kids to try them tomorrow for lunch. Yeah! I was like, wow, these taste just like goldfish when I ate half of the pan, lol. You can freeze them and reheat them later. I’m glad you enjoyed them! We’re gf/df… Any word on whether the Parmesan can be traded for nutritional yeast?